The protests of the gilets jaunes (yellow vests) has resulted in violence against police forces as demonstrators are frustrated that the governments refuse to yield. In the north of France and certainly in the southern part of neighboring Belgium and on the French island Réunion last night was very unruly. Police forces were attacked with molotov cocktails and fuel bombs as they tried to clear the roads. Related coverage: <a href="http://thegoldwater.com/news/42903-France-Tax-Fuel-Protests-Continue-Media-Speaks-Of-War-550-Wounded-2-Dead-Video">France - Tax Fuel Protests Continue - 550 Wounded, 2 Dead</a>. A group of people who campaign against the high fuel price have since this weekend put a blockade in the Belgian town of Feluy, where French oil company Total has a major depot. After several days of riots, the RTBF spoke Wednesday night of 'scenes like in a warzone'. An estimated 300 people blocked the E19 for a while and the police intervened with a water cannon. Video made by a demonstrator show that Molotov cocktails and stones were thrown at the police from the top of a bridge. The images also show that a fire was started on the highway. A cameraman of the French-speaking public broadcaster was also attacked. 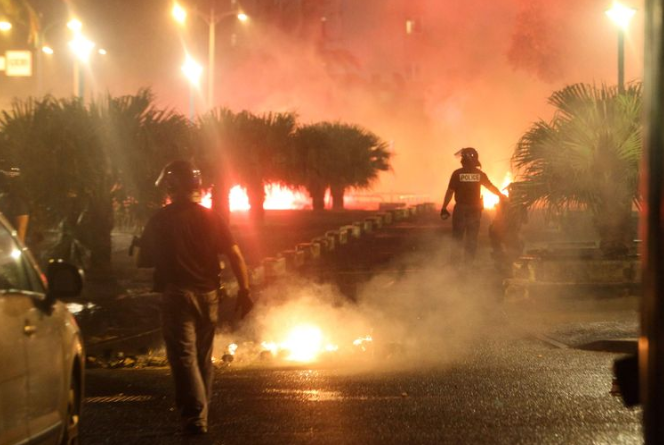 The situation on the island of La Réunion remains very tense. There were riots, roads were completely blocked on the island and shops were looted. In total, only 16 agents were injured last night, one of them remains in a serious condition in hospital. France has decided to deploy soldiers to keep the peace in the island. The result for the business community in France is mounting. Supermarket chain Auchan speaks of a loss of turnover of 'several percentage points'. The car factory of PSA (Peugeot and Citroën) in eastern French Sochaux had to close several assembly lines because dozens of trucks carrying parts are stuck all over the country. This also applies to many other trucks. The French minister for Transport and Logistics says the consequences for the sector are 'dramatic'.